As promsied here is my recipe for my Grilled Garlic Cilantro Lime Shrimp. It's been a hot week here in L.A. with temperatures above 80 degrees. This is unusual for January, so now I will make some unusual January food. Instead of chili's and stews like I normally would be making this time of year, we are all seeking relief with fresh, chilled salads. The recipe for these shrimp is very versatile. You can enjoy this warm as an entree, chilled with cocktail sauce, on a salad, or as is. Combine all ingredients in a medium mixing bowl or ziplock bag, allow shrmp to marinade in mixture for 15 minutes prior to grilling. Preheat your grill. Grill shrimp on skewers or in a grill-safe basket until shrimp are opaque and cooked-through to an internal temp of 145 degrees. 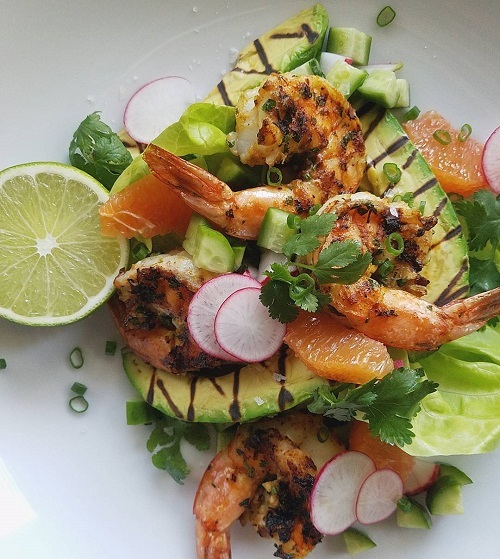 Serve with garlic butter, grilled avocado, fresh lime wedges, or cocktail sauce.